Do you want more sales from social media? Looking for new ways to share your products on social? The latest features from Pinterest, Snapchat, Facebook, and Instagram can help you get your products seen by more people. 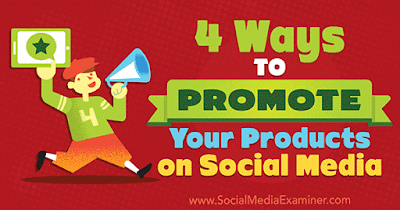 In this article, you’ll discover four ways to promote your products on the top social media platforms. Now that Instagram feeds are arranged by popularity rather than in chronological order, it’s more challenging to get visibility for your business. Posting Instagram stories can help you get in front of your target audience. Instagram also lets you include links and mentions in your stories, which will make it easier for viewers to browse and shop your products. Take a look at this Instagram story from social media influencer Caila Quinn. 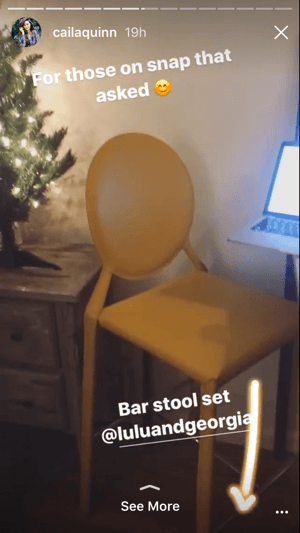 She included a link to a yellow bar stool because many of her followers had asked for more information about it. Notice the See More prompt at the bottom of the video, which encourages viewers to swipe up. Influencer Caila Quinn includes both a mention and a link in her Instagram story. The mention in this Instagram story is also tappable (as shown below) and takes followers to the official Lulu & Georgia Instagram page. When viewers swipe up on the See More tab, they’re taken directly to a page on Caila’s blog, which features a number of products for sale, including the yellow leather bar stools and other items in her house. Instagram opens linked pages within the Instagram app, providing a seamless transition between browsing Instagram and shopping on an ecommerce site. To see if this feature is enabled on your account, go to your Instagram home screen and tap Add Story at the top left. After you film a video or take a picture, look for four icons in the top-left corner: Link, Audio, Drawing, and Text. If you don’t see the Link icon, you don’t have access at this time. If you do see it, tap on the Link icon and paste your link. Choose businesses or publishers who have audiences that align with yours. They can draw attention to your account by mentioning you in an Instagram post. 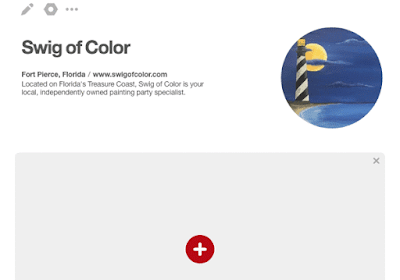 Make sure you have a featured link at the top of your profile where people can browse your products. Work with influencers who often get access to features before everyday brands. An influencer can talk about your post in an organic way to create interest in what you’re doing. Facebook business pages have traditionally been a great way to connect with your audience and promote products and events. Now you can feature your ecommerce page directly on your Facebook page with the StoreYa app for Facebook. StoreYa’s WooCommerce Shop to Facebook plugin supports 30 ecommerce platforms including Etsy, eBay, Magento, and others. This example will show you how to connect a WordPress-supported WooCommerce shop to Facebook. To get started, open your WordPress dashboard and click on the Plugins tab. Then search for the WooCommerce Shop to Facebook plugin by StoreYa. After you install the plugin, it will appear in your Installed Plugins section in WordPress. Next, click the WooCommerce tab in the left sidebar (just above Plugins) and click Settings. You’re then prompted to go to StoreYa’s homepage. Click Connect Facebook Fan Page. Now you’ll see the Import your WordPress Store Onto Facebook page. Note that you can add other ecommerce stores, like Etsy and eBay, by clicking Choose Another Import Solution. Paste your ecommerce store URL in the field and click Continue. Wait a few moments for the page to load and then click the green Preview button. Click the Visit Facebook Store button to see what your store looks like. One great feature of the app is that it imports all of your categories, so your products remain in the same hierarchy as your ecommerce site. This is also true when you connect your store through Etsy or another ecommerce platform. 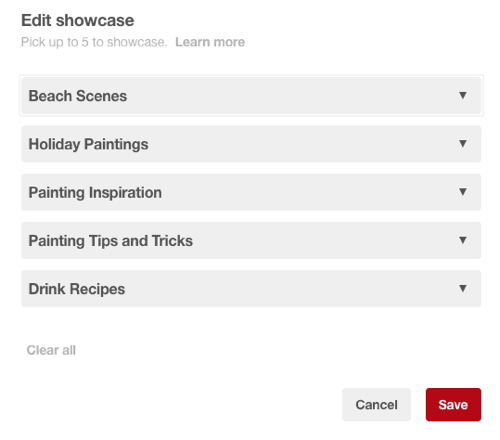 One of Pinterest’s most promising new business features is Showcase. 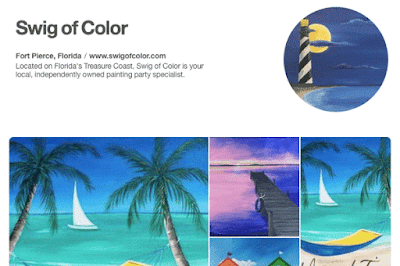 It acts as a virtual storefront for businesses and lets you put your best products on display in a rotating gallery that can easily be updated. 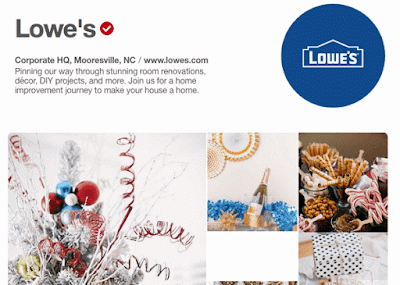 Lowe’s featured a variety of holiday-themed boards in their showcase throughout the month of December. They included buyable pins that link back to their website, as well as inspirational and informational pins that link to other related websites. To set up a showcase for your Pinterest business page, go to your page and click the red Add button above Build Your Showcase. Next, you’ll see the Edit Showcase window with five slots for adding featured boards. Choose the boards you want to feature. Keep in mind that this is designed for buyable pins and standard pins, so it might be beneficial to feature the items you have for sale. After you’ve selected your featured boards, click Save. You’re then brought back to your homepage where you can view your newly created showcase. The best part of the Showcase feature is that you can change and adapt it at any time depending on your business goals. As always, it’s a smart idea to test the type of content you post and the frequency of your posts to see how your customers best respond. Snapchat ads, which appear between friends’ stories, are reserved for well-known brands with large advertising budgets. For businesses that don’t have the resources or brand recognition to pursue such advertising, Snapchat stories are a free strategic channel for promoting an ecommerce business. Take a look at cost-conscious clothing retailer Everlane, for example. 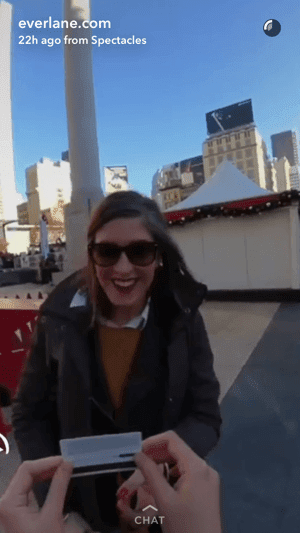 The company posted a holiday-themed Snapchat story that both engaged viewers and generated brand interest in a non-promotional way. 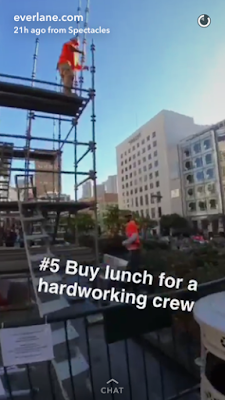 The story followed two brand ambassadors as they performed random acts of kindness, including handing out Everlane beanies to strangers, buying coffee for people in line at Starbucks, handing out a free AMC gift card, and buying lunch for a construction crew. After showing their audience which gift they were going to give, they recorded each person’s reaction to the random act of kindness. The company then urged their followers to “go out and spread those good holiday vibes” with the world around them. This well-planned Snapchat story illustrates two effective tactics to better engage with your audience. First, Everlane was able to engage people both in person and in digital spaces. 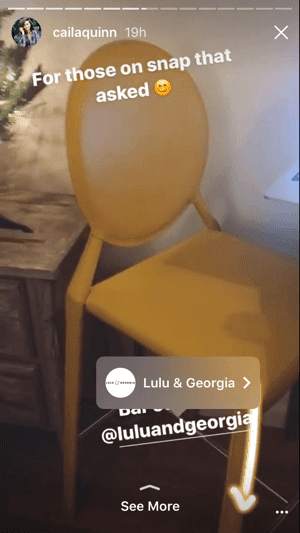 Online retailers usually interact with customers in online spaces only, so using a Snapchat story to interact with people in real life is unexpected, and therefore memorable and impactful. The two women who received free Everlane beanie hats will forever remember the positive interaction with the company. 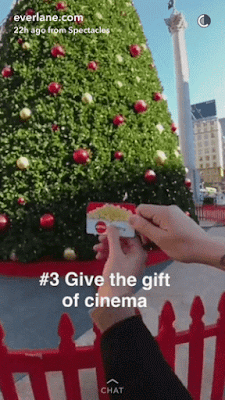 Second, the free lunch, coffee, and movie gift card provided a less-direct brand experience than the beanie, since it didn’t involve an Everlane product. These acts show the company’s caring side and reinforce their commitment to honestly priced, ethically sourced clothing. This tactic balances the free product giveaway so the Snapchat story doesn’t seem purely promotional. As you craft a Snapchat story for your business, consider how you can generate interest in your products while reinforcing your brand message. Your goal is to create a memorable experience that makes an impact on digital viewers in real time. Social media can be a powerful source of ecommerce revenue, so don’t miss out on the latest features today’s social platforms have to offer. What do you think? How do you use social media for your ecommerce business? What tips can you offer? Please share your thoughts in the comments below.